Osseous surgery is required to address and treat advanced periodontal disease (gum disease). 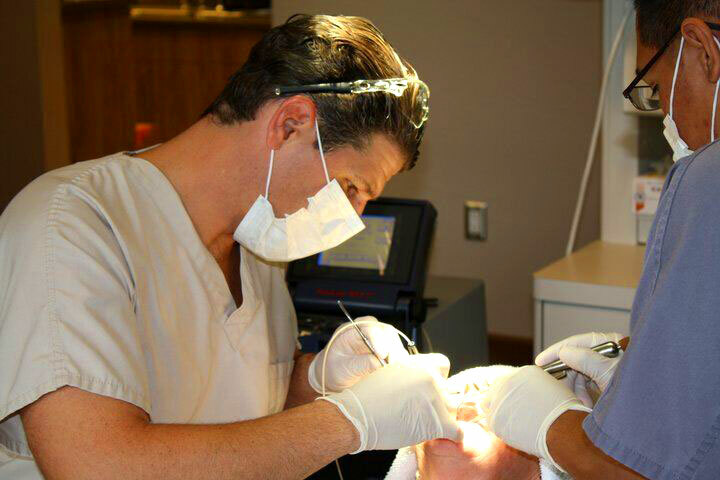 This procedure is the most common therapy needed for advanced periodontitis (gum disease). Osseous surgery is a general term used to describe periodontal surgery. It is used to address gum pockets and bone damage around teeth. It is usually needed when non-surgical cleanings have not stabilized the current disease process. The procedure is performed in order to reduce inflamed or infected tissue and repair the damaged bone that remains around the teeth. The ultimate goal is to create a clean environment between teeth, so that ideal oral hygiene can be performed on a day to day basis by the patient. Prior to the procedure, the area will be numbed using local anesthesia. Intricate micro-incisions are made around the teeth. Sometime a laser will be used to perform this procedure. The gum is then lifted so that there is direct access to the infected roots of these teeth. The surface of each root is then thoroughly cleaned of any bacterial plaque or tartar buildup. Next, the bone is repaired. In order to ensure proper healing, smoothing of any rough surfaces is also necessary. After the surgical site is cleaned and smoothed, the gum tissue is re-attached back into place. After the procedure, you may be prescribed antibiotic and back-up pain medication. If stitches are used they will likely dissolve or be removed in 6-10 days and the post-operative follow-up appointment. About a month after surgery, an appointment will be scheduled to check on the healing of the area and initiate the needed maintenance cleanings. Because some gum tissue is trimmed during the procedure and this disease severely damages the bone around teeth, the teeth may appear longer in the mouth (show recession). It is normal but necessary to save teeth and maintain the function of your dentition. A common issue initially after treatment is cold sensitivity. This can be addressed with various toothpaste and medicaments. This video shows you how osseous surgery, or pocket depth reduction, can be performed to restore gums back to health.